Hello there, you beautiful people that I haven't written for in a long time. I have not forgotten you or this blog. I've been feeling incomplete each time I remember or realize that I don't write and post things as often as I'd like to. This blog has become but a spec in the internet world, making me feel very disappointed, yes. Not cool, I know. I have been debating my potential future career now that I am in college and thought this aught to be the time when I get it together and decide finally what I will study. I am done with taking random courses just to kill time while I make up my mind. Don't get me wrong, some of those courses have been nice, like "General Astronomy," but I know that I shall begin to focus more on what's important to me and my future. Interior Design is what I have concluded to study. Does that come as a shock to you? It sure did to me even though I always knew to love this field. I seemed to be putting it off because I wasn't sure if this was enough for the quality of life I have dreamed for myself. I thought very hard that I will be miserable my whole life if I was stuck in a job I didn't love and so chose to follow my passion. Not just this, but on my spare time I've been designing for a couple clients who have trusted me enough to hand me the reigns of their home's decor and design. All has not come easy as expected as a lot of this is not a simple "put your sofa here and your dining table here". As you probably may know, there is more to designing a space well, than meets the eye. Despite all this, the challenges push me even further and encourage me to continue my passion. Heck, those challenges make me want to work even more and that alone is great for me because it shows how much I am willing to go through with this job. Shows that in the future when I may be exhausted of working, this job will keep me intrigued. I am now applying to an interior design school so that I may become a practicing expert in the field of design. I have studied loads about interiors but I have more to learn if I am to provide my services at a professional level. I am eager and excited to start this journey and for the potential clients that I will help. I am going to leave you with a couple mood boards that I have created for some clients and others that I design for myself, because hey, this chica loves it. I will definitely keep you posted on the outcome of my application to this school and on any projects I work on in interior design. Woo-hoo. If you find to be needing my help designing your spaces, please don't hesitate to contact me. I would be delighted to assist. 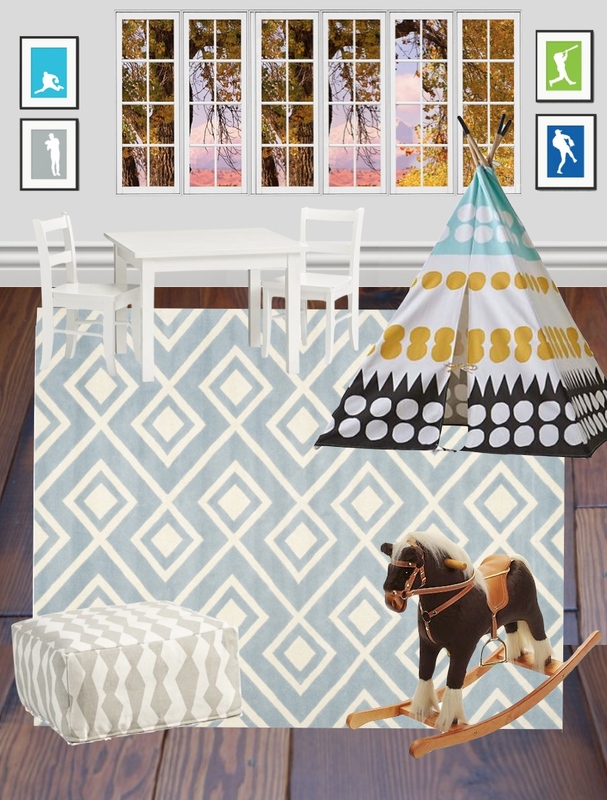 Below is a mood board of a playroom I began to work on for a client. Really love the teepee and the mix/match of the patterns. The overall idea here was to create a space where the child can sit and read, hence the bookcases and the bench. Plus, floor pillows and poufs for lounging and comfort when on the floor with the toys. This mood board of the living room + accompanying areas such as the entryway etc, is of an actual project I am working on with a client. I am happy to say that after this first proposed design, she was very pleased and decided to go forward with purchasing the items found in the mood board. Once the rooms are completed I will share with you the finished look. I really love the simplicity of a neutral, white nursery where one can utilize the neutral base to our advantage. Introduce pops of any color throughout the seasons or the change of your mood with the help of pillows, artwork and linens which can always be interchanged easily. This lounge space is meant for exactly that. Lounging. With the daybed and two accent chairs in a neutral gray, the mood is set. I included a pouf and a floor pillow because people like lounging on the floor too, no? Grab a drink, your favorite friend and just relax in this serene space. One of my favorite mood boards, I think so far. I call this a chic teenage bedroom retreat. With so many sitting options you know the teenager in your life will not want to leave their bedroom. In short, I am keen on including not only a bench at the foot of the bed, but I love the idea of providing a small settee or love seat for lounging. The modern lines of the bed and the dresser play well with the more rustic look of the bench. This contrast is also seen with the color scheme of warm and cool tones of yellow, gold, and cream. Hope you enjoyed the mood boards. What do you think? Would you like me to share more of those? Feel free to leave your suggestions as to what mood boards I shall create and share in the blog.